For all your custom windscreen needs! Starting with the first clear acrylic stand-alone windshield, Slipstreamer has been manufacturing quality windshields for more than 40 years. 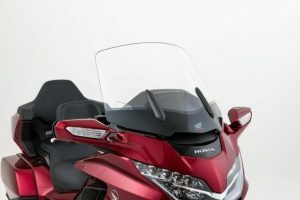 Our product line has grown and now includes windscreens that fit many makes and models of motorcycles, ATVs, UTVs and scooters. Looking for more information on our products? Are you curious what our suggested retail prices are? Not sure if a Slipstreamer windscreen needs extra hardware? Wondering how to install your new Slipstreamer windscreen? See below to download our catalog, suggested retail price guide and application guide and also view installation instructions. If you have any questions, please call us at (763) 780-9757. New for the 2018 Honda Goldwings– These are our newest addition to the Slipstreamer OEM replacement shield line. The T-268 Wraparound and the S-268 Sport Touring shields. They are direct replacement shields designed to offer superior wind protection and sportiness than the Hondaline OEM screens. They each come in 3 heights of stock, +2″ and +4″ for better passenger protection. The Wraparound is 4″ wider throughout the shield where the Sport Touring model is 4″ wider at the top only. Available now! And don’t forget to customize it through our Custom Garage section!